A resident put in a left subclavian line and maybe went a little too far. 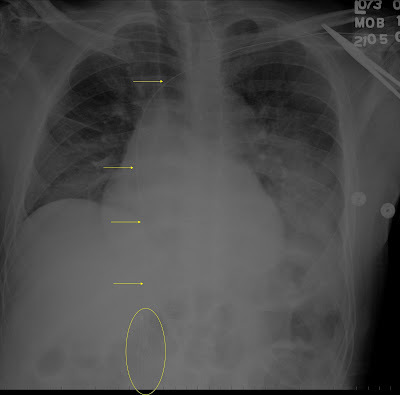 An xray shows that it went into the right atrium and into the IVC and up to the IVC filter. When it was removed (with help from vascular), the filter had migrated up 2 vertebrae... Click image to enlarge. It is a bit dark. A submission from a reader: "34 year old, non-smoking African American female presenting with a recurring (for three years now), chronic (lasts for several weeks up to a few months) dry, non productive cough. No other symptoms (though the attached CT report says wheezing). No response to a variety of drug treatments over the years, including steroid shot, Levaquin, OTC Mucinex, OTC Claritin, Tussionex, Nasacort, OTC Prilosec, 6-day regimen of Metrol (4mg), Advair and Albuterol. First pulmonologist (who performed no diagnostic tests) diagnosed asthma and allergies. Nothing indicated on chest x-ray. Internal medicine doctor ordered CT scan (report attached). Second pulmonologist said subpleural cysts exist, which he indicated exist with UIP patients, but he said this was not UIP. Also said it's not tuberculosis or sarcoidosis. Prescribed 20 mg of Prednisone twice a day to get rid of cough, said we will proceed once cough is gone. Said a lung biopsy or thoracic biopsy may be in order.